So today (Wednesday) I had scheduled a play date for Hazel with a very shy boy that will be in her nursery class next fall. His mother and I wanted to get the kids together so they would have a friendly face the first day they go to school since it will be the first time we are leaving them at school without us. (We both were in different parent/child classes at the school this year.) I also took the Play Dough Pledge this week. I figured I would combine the two so the kids would have an activity to do while getting comfortable with one another. (Note: All of the recipes I used this time came from Playdoughrecipe.org.) I made two different types of Jello play dough (peach and lemon) and put them in the refrigerator. I added lavender and sprinkles to the lemon for more scent and texture. 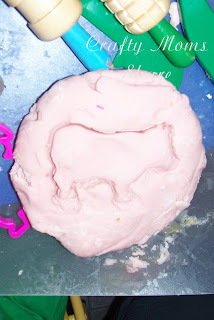 Then I made a rubbery play dough and cloud dough. 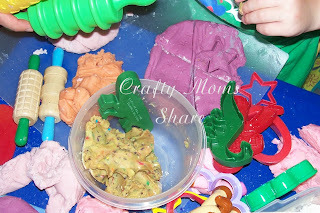 This morning Hazel and I made an oatmeal play dough. 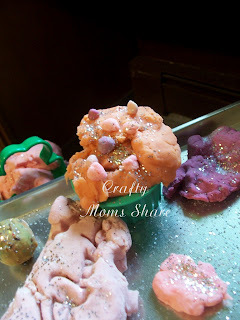 Then once our play date got here, we made two types of classic play dough with a little experiment of adding juice concentrate to color and scent it. I had some grape juice and raspberry cranberry juice that I used to dye fabrics yesterday and saved some for the play dough. We ended up adding quite a bit more flour to make it a good consistency with the extra liquid from the juice. The recipe seems very easy and it really is, but we adjusted it to get a dough we liked. 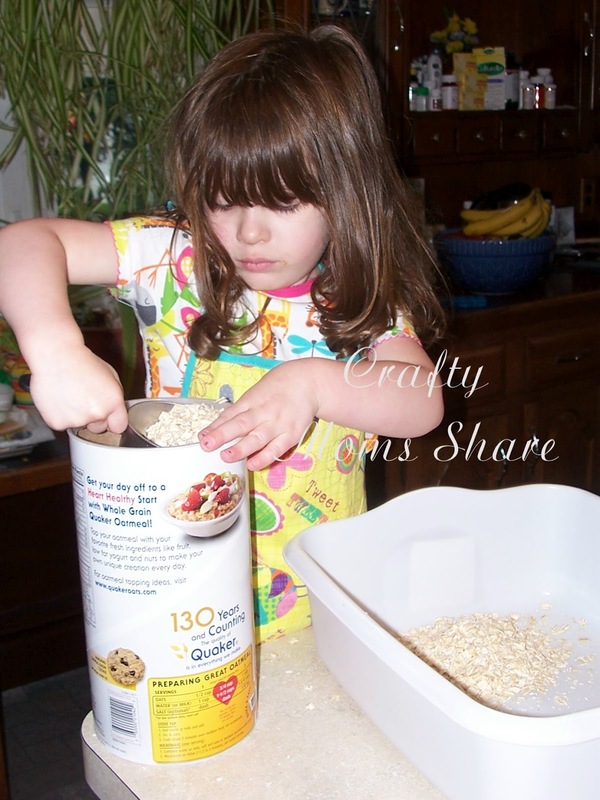 The recipe calls for 1 cup of flour, 2 cups of oatmeal, and 1 cup of water. Then there are suggestions of using corn meal or coffee grounds to make it less sticky. We chose corn meal since I don't really like the smell of coffee and didn't want it on my hands. I also added more oatmeal to give it more texture. Next we brought her small table and chairs from the craft room up to the kitchen where it is more comfortable and a bit cleaner. We also brought up all of her play dough tools and got some cars, plastic animals, sand castle tools and baking dishes and some glitter so everything would be ready to play with. Then I measured out the flour, salt and cream of tartar for the classic recipes and left them in measuring cups and bowls waiting for the kids to pour and mix. I also measured the water and put it in my electric kettle so I could get it boiling. By this time, Hazel could not wait for them to get here. She is actually drumming on the tupperware containers that hold the Jello play doughs. She was dancing/skipping all over the place. When her new friend and his mom arrived, we made the classic recipes. (I thought this freshly made and still warm would also add a nice contrast to the ones that had been in the refrigerator.) 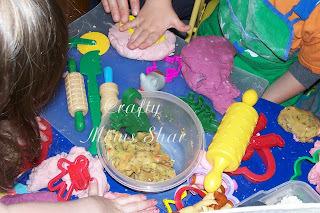 Then they started to create and play. They seemed to have fun. 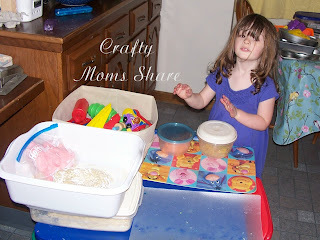 Hazel wanted to make cookies and fill the cookie sheet as well as two muffin containers. 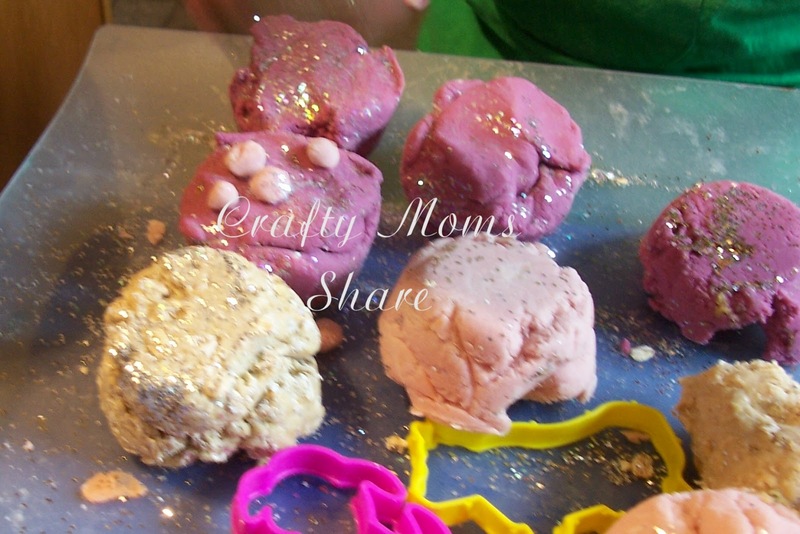 Her friend started with the rolling pins (the textured ones), cookie cutters and dough cutters. Then he liked the glitter. While Hazel worked on her cupcakes and cookies her friend made a pan of muffins. He put glitter on the bottom so they fell out when he tipped then over. 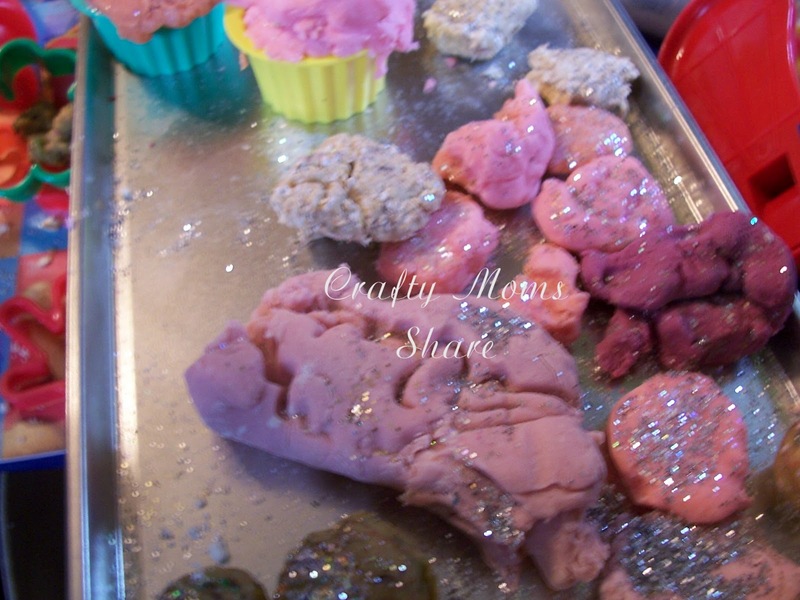 The kids did not seem to get into the cloud dough too much. Hazel's friend used it to decorate his cupcake/muffins like it was cheese (or at least that is what it looked like), but otherwise they didn't really touch it. I think I'll see if Hazel will play with it later with me or tomorrow. 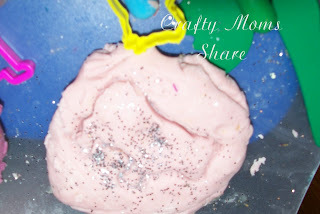 They had the most fun just adding glitter to everything! 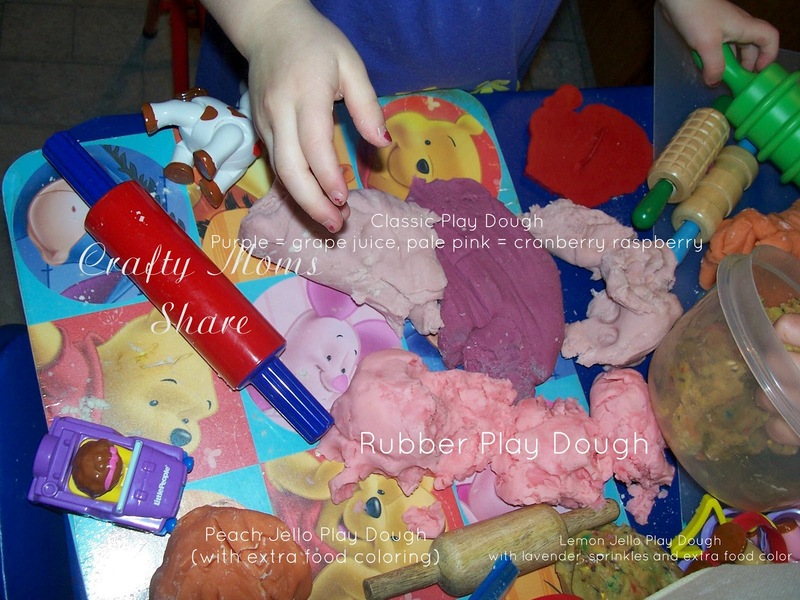 So will you join us by taking the play dough pledge? Such a great idea for a play date. We have a few more awkward one where our eldest kids tend to clash interests. I think something like this would help them bond!